* 9 days before Christmas 2017 , she came into Babylon Shelter as an owner surrender after shelter staff went to her house & saw that FENDI & her puppies were living in a pen outside. She welcomed them into the pen to see her babies. ** 2 weeks ago FENDI performed like a pro while PBS filmed her 45 minutes or more for an upcoming episode of the show ” Shelter Me”. This episode (to air on TV in the fall) centers on Dagger DogVinci & the gallery show of 41 paintings by the talented Labrador sold to raise funds to equip the new Babylon Shelter opening soon. During filming in the shelter yard, FENDI responded to every command from a volunteer while interacting with Yvonne- Mom & mentor of Dagger the canine artist and with Chris -shelter director . FENDI never lost her focus or attention nor was she put off by by the men with the huge cameras. Her performance was flawless. A Star is Born. 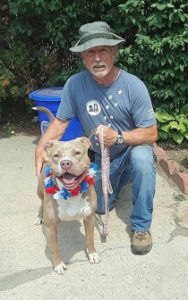 ..
and that star just moved to Last Hope in Wantagh so we can showcase this great dog for adoption in our smaller setting. 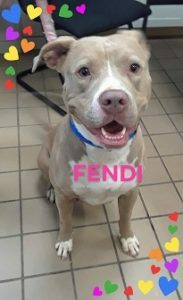 Come Meet FENDI at Last Hope . She’s a Pit with lots of pet potential too.